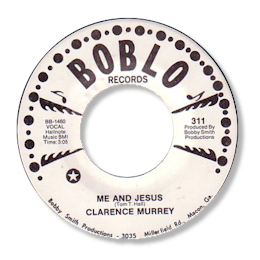 Clarence Murray and his rather more famous brother Mickey spent almost all of their recording careers in Macon, GA. Clarence came into secular recordings via time in various gospel groups. He worked with the ubiquitous Bobby Smith in the Georgian town for several years, and Smith sent his tracks to Shelby Singleton for release on SSS International, and also to King, with whom he had a very close relationship, for release on their Federal subsidiary. His first 45 included a version of a deep soul classic One More Chance. This had already been cut by the wonderful Jimmy Braswell, also in Macon. Murray’s version is a very similar arrangement but it is taken a slightly brisker pace and his vocal isn’t quite as desperate as Braswell’s. But this version won’t cost another mortgage! 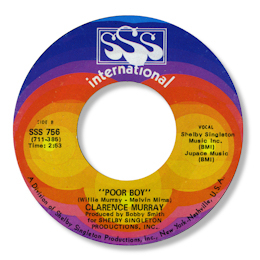 Murray’s second single features another outstanding cut – Poor Boy. His vocal performance here is simply wonderful, hoarse toned and full of screamed phrases that make the hair on the back of your neck stand up. I just love this track to bits. Murray spent some time with the Swanee Quintet and you can hear their version of this great tune here – could it be Murray singing the lead? 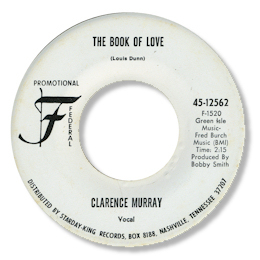 Murray’s final SSS Int 45 was recorded in Muscle Shoals, and it featured “Dancing To The Beat” far and away his best uptempo track. This insistent toe tapper is a very fine example of southern soul as dance music. Like his brother Clarence now appeared on Federal and his only single for the label included a good verison of Dan Brantley's "Please Accept My Love". UPDATE ~ Peter Hoogers writes with details of Clarence's Boblo 45, plus MP3 files and the images of the actual disc. Sadly neither side is as good as his earlier tracks. But I'm really grateful to Pete for alerting me to this 45 - now in the disocgraphy. "Mr. Murray attended Central Elementary and Jefferson High School. He was a gospel singer, singing with the Dixie Jubliers, The Glorious Kings and the Swanee Quintet. One of his hit recordings was "How Much Do I Owe Him" and many more." He is survived by 4 sons 2 daughters 9 grandchildren and 1 great grand child.